I learned my lesson. I was just running down to Upperville on Sunday morning to pick up one of Cam’s classmates to work on a school project at our house. No need to bring a camera, as it was a quick 20-minute drive to his house and back. Well, I knew it was a huge mistake when we spotted a bald eagle sitting on a tree not more than 10 feet from the road. I realized that even if I stopped, the iPhone just wouldn’t cut it and I’d be more frustrated with a bad photo than none at all. On we went. Then, as I pulled into their driveway, I noticed this antique tractor parked next door under the trees. Thankfully, the iPhone did the job. When I returned later, I made sure to bring my Nikon along for another version…unfortunately, the bald eagle wasn’t as patient. Beautiful photo. I, too, have had those moments when I ran a ‘quick’ errand without the camera. Now I never leave home without it. Thank you, Cecelia! I have had my camera with me each day now…it’s going to just become a habit! Perfect colors in this scene. Oh no……ANY picture is better than no picture!!! In today’s world, you can manipulate a bad photo and make it interesting BUT, you never have to do that with your eye for the extraordinary!!! L.
So true. It was one of those moments where we just “took a mind picture.” Cam and I drove by the eagle and simply watched it and marveled in its beauty. We actually have a collection of these images now, “pictures” that we’ve seen but not taken for various reasons. We now reminisce about them on our trips. Sorry you missed the eagle. 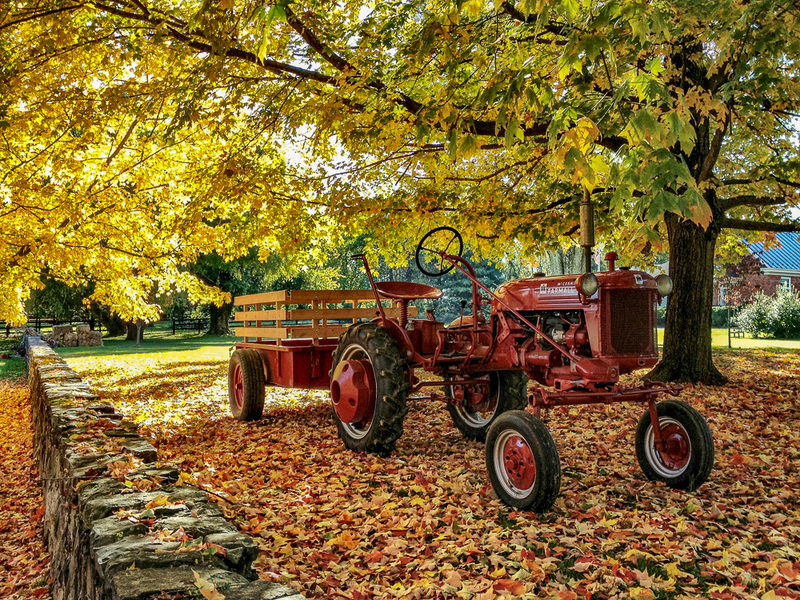 Do love the tractor under the tree with all the pretty leaves. Thanks so much! I do feel as if the tractor was a small reward on the day. I didn’t have to worry about it flying off when I stopped and took out my iPhone! Wow the antique tractor and trailer look perfectly at home under the tree. Great photo and good eye to see this! The tractor is pretty amazing. I remember seeing it during past events (it was used that weekend for tractor rides at a fund-raiser for the child care center you can see in the background), but this was the first time I had the opportunity to study it. Someone certainly spent time and TLC on it!